Fans have a creed too. Unlike the Church, ours is not spelled out or even welcoming. Our creed is a winnowing process based on loyalty. Doubting one’s team in between playoff games earns you a lifetime ban from this church. You show loyalty to a team whose ownership are cartoonishly dishonest about their business dealings, we are impressed. Think about it. Since the end of the 2005 season, being a loyal Marlins fan would put you near the top of the Fan pyramid as surely as Gordon Cooper was atop the Astronaut pyramid on May 21st 1963. The Marlins had at least one fan with the right stuff. His name was Louis Mendez, Sr. and the stuff he used were commemorative pins. I’ve heard it mentioned–and I agree in part since I was there with a few of my Emmaus brothers–that if we had to pinpoint the moment the Miami Marlins began benefiting from a home field advantage at their new ballpark, it happened in a May 21st game against the Colorado Rockies. In the 4th inning of that game, Giancarlo Stanton hit a bases loaded home run against Jamie Moyer. That’s one way to describe it. Here’s another. A 22 year-old hit a grand slam off a 49 year-old pitcher who was was in MLB before the hitter was born. The pitch came in at 72 mph and came off the bat at a record speed of 122 mph. It was a home run even a Roy Hobbs would have bragged about, if he drank. But here’s the thing, there was a buzz in the ballpark even before the 4th inning grand slam. This in a game the Marlins trailed 4-0 before our starting pitcher had registered an out out. This on a pre-summer Monday night game against a last place opponent whose fan base actually still lives within electric car driving distance of the team they root for. If you’re wondering what’s the big deal, I’ll take that as evidence you haven’t been a Marlins fan. Let’s go back exactly 11 months to a Marlins win in a June 21st game. Part of the pleasure of following a team through a 162 game season is the constancy of it all. The Marlins manager that night was Jack McKeon. The victory broke an 11 game losing streak. The winning pitcher was Javi Vasquez, the save went to Leo Nunez and Gaby Sanchez homered. In one way and another, all those names are gone today. So even in a sport which thrives on the familiar, much can change. 1st pitch honoree Brandon Mendez – grandson of Louis Mendez Sr.
Louis was born November 4, 1940 in Puerto Rico. After moving to Brooklyn, NY as a teenager, he married Isabel Jimenez and raised a family of 3 boys: Louis Jr, Anthony, and Victor. Louis and his family moved to Miami Lakes in 1983 where he has resided for the past 27 years. He is survived by his wife, 3 sons, and 8 grandchildren: Nicholas, Kevin, Anthony Jr, Michael, Jonathan, Danielle, Monique, and Brandon, all of which he proudly had tattooed on his right bicep. Louis may be better known to some as “The Pin Man”. 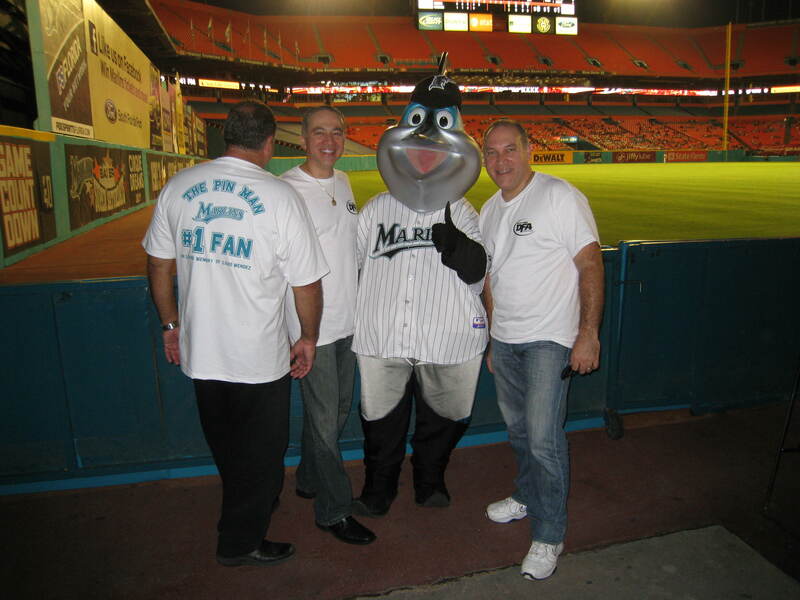 He was an annual season ticket holder and a super-fan for the Florida Marlins. 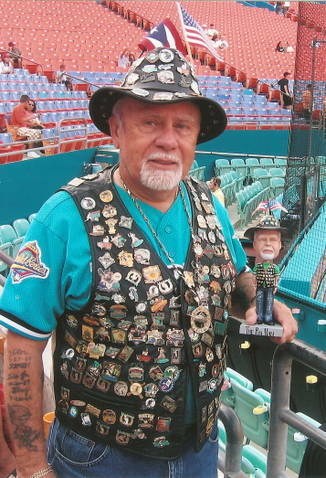 He would wear his pin-filled leather vest to every home game. 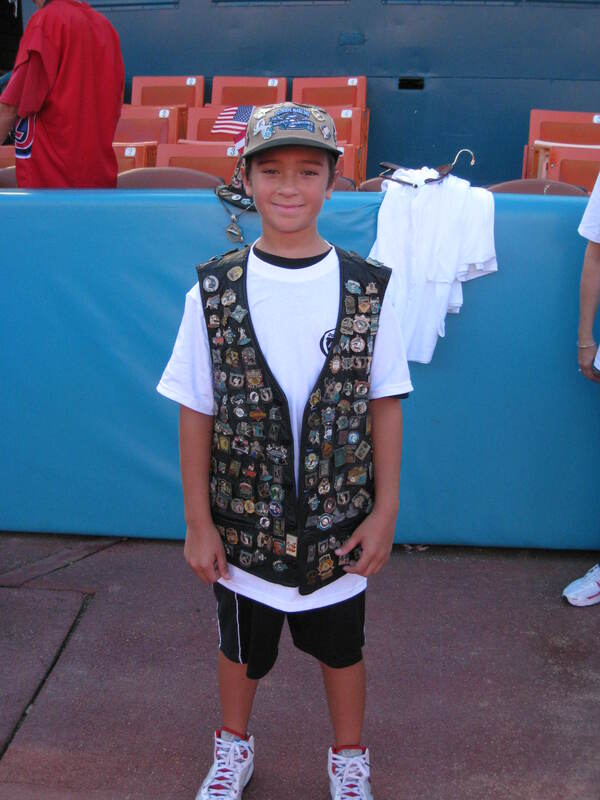 Displaying more than 300 commemorative pins, most of them celebrating the Marlins, Louis Mendez’s black leather vest is almost 15 pounds of baseball passion. The 3-year-old vest, with pins touting the Marlins’ inaugural series against the Dodgers in April 1993 and the team’s wild-card win this season, has made Mendez popular with fellow fans. He has posed for countless photos, he said, and Marlins vice president of marketing Sean Flynn knew of Mendez simply from seeing him so often on the Pro Player Stadium JumboTron during the regular season and playoff games. “He’s one of our most visible fans, that’s for sure,” Flynn said. A warehouse manager, Mendez said he doesn’t deal or trade pins, merely acquires them, and estimated the pins cost him between $8 and $20 each. He has been offered as much as $10,000 for his vest, he said, but he’s keeping the collection for now. “They are very popular, especially for Little Leaguers,” said Grant Twilley, sales manager for Oviedo-based All About Pins. He said the pins are a big part of the experience for teams as they advance through the playoffs to the Little League World Series. Both Twilley and Flynn said some of the pins’ popularity comes from their small size, low cost and their ability to be worn on anything from business suits to baseball caps. They’re also flexible, with pins available for major and minor sports teams, cities, organizations and corporations. Many of Mendez’s pins are of specific players, most of them Marlins or former Marlins. Moises Alou may be playing for the Cubs these days, but on Mendez’s vest, he’s wearing the teal of the Marlins. Mendez has a Sammy Sosa pin too, and he’s resisted hiding the pin during the Cubs-Marlins series. Asked about which of the 27 dozen pins are his favorites, Mendez unhesitatingly named the three marking the Marlins’ march to the 1997 championship. Honoring the Marlins as wild-card winners, National League champions and World Series victors, the pins are prominently displayed on the front of his vest, while less-favored pins, such as those featuring interleague games, are relegated to the back of the vest, above the embroidered “God Bless America” recalling the Sept. 11 terrorist attacks. Mendez would love to find room on his vest for three more pins, marking a Marlins victory in the 2003 World Series. But first, the team has to go all the way. To my fellow Emmaus brothers at the Stanton grand slam game — Felipe [a Right Stuff dad to Victor], Bill [elementary schoolmate of Lew Alcindor], Hely [father of future Right Stuff fan, Hely Jr.] and Javier [the middle of 3 generations of Rodriguez men at the game], let me apologize now for bringing up the game whenever we see each other again. To yet another Emmaus brother, Louis Mendez Jr., the loyalty gene clearly runs in the family. Your Dad’s loyalty no doubt was reflected in the other parts of his life and I have first-hand knowledge that his son’s loyalty to his faith, family and work, inspires his friends to do likewise. This entry was posted in 2TG Favorites, Catholic Faith & Inspiration, Miami Marlins & MLB and tagged Brandon Mendez, Emmaus, Giancarlo Stanton, Gordon Cooper, Lew Alcindor, Louis Mendez Sr., Robert Redford, Roy Hobbs, The Natural, The Pin Man, The Right Stuff. Bookmark the permalink.